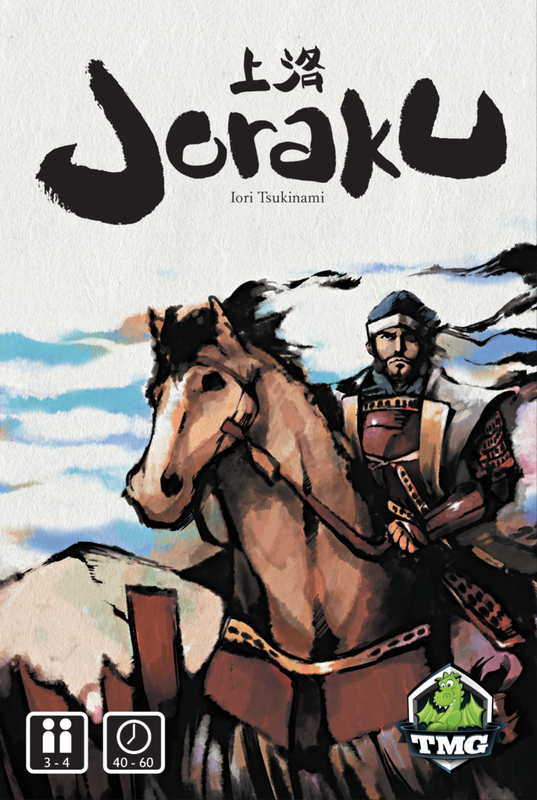 Joraku is a game by Iori Tsukinami, published by Tasty Minstrel Games. It is for 3-4 players. In this game, players take on the role of a warlord or “Daimyo” in feudal Japan as they fight to rule over all. They will have to outwith their opponents as they employ the help of loyal Samurai to gain control of areas and build prestige. In the end, the player with the highest reputation among warlords, will be declared the winner. To begin, each player chooses a color and takes the reference card, Daimyo token and Samurai tokens of their chosen color. The map boards are placed on the table beside each other in numerical order. The Daimyo cards are shuffled together. Each player is randomly dealt one card face up. The player with the highest number on their card receives the the Kachidoki card. Each player will place their Daimyo token on the area of the map that has the same number as their Daimyo card. They will also place one of their Samurai tokens on the 0 space of the Reputation Points Track. The player with the Kachidoki card is the first player. Play now begins. The game is played over 3 rounds. Each round is divided into 3 phases; recruit, skirmish and prestige. The first phase is the recruit phase. In this phase, the skirmish cards are shuffled together. A number of cards are then dealt to each player based on the number of players. The remaining skirmish cards are set aside face down not to be used during the round. Each player will then look at their cards and choose 2 to pass face down to the player on their left. Once all players have done this, the next phase begins. The next phase is the skirmish phase. In this phase, each player will play 1 skirmish card from their hand, beginning with the first player. Once the card is played, it’s effect is resolved immediately. This can be adding samurai tokens to the map or gaining and spending action points. After the first card is played by the first player, each consecutive player must follow the first player if possible. That is to say that they must play a card of the same suit as the one played by the first player if possible. If they don’t have one, they may play a different card. Once all players have played a skirmish card, the winner of the skirmish is determined. If a player played a 6, then the ninja card will win. Otherwise, the player that played the card with the highest number wins. The winner of the skirmish then takes the Kachidoki card to become the first player for the next skirmish. Players that are in the area of the winner’s Daimyo tokens will be awarded bonus reputation points based on the scoring chart on the Kachidoki card. This process is then repeated again until all the cards in a player’s hand have been played. Once this is done, the next phase begins. The final phase is the prestige phase. In this phase, players compare their influence in each area and earn reputation points, starting with the area 6 and moving through each area toward Kyoto. Daimyo tokens count as 2 influence points while samurai tokens count as 1. Each player will then earn points according to the scoring chart for each area. The player with the most influence gains the 1st value, while the second most influence gains the 2nd value. The 3rd value is given to the player with the third most influence. Once scoring has been resolved for each area, a new round begins. Players will not remove their tokens from the map. The game continues until the end of the third round. Once this happens, players compare their reputation points. The player with the most points is the winner. The pieces for this game are quite nice. There are the Daimyo and Samurai tokens that are all brightly colored and made of sturdy wood. The Daimyo sort of look like a samurai’s helmet, while the samurai tokens are just cubes. There are several different types of cards. There are the Daimyo cards which showcase a very impressive and imposing warlord. 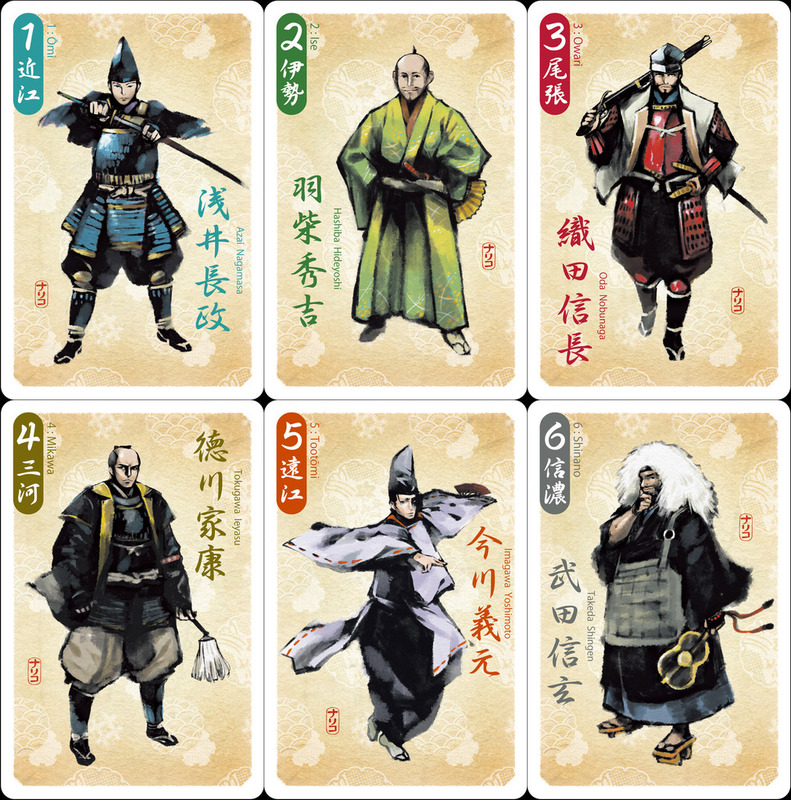 Then there are the skirmish cards which have different samurai and ninja designs. The artwork on both of these card types is really great. I love the different designs and think they’re great. There are also reference cards as well as some variant rule cards to change things up in the gameplay. These are mostly text on a colored background but are much appreciated and a welcome addition to the game. Finally there’s the Kachidoki card. This card has much the same style of art as the Daimyo and skirmish cards except that it’s a bit smaller. The map boards are pretty interesting. There’s not a lot as far as art goes but it gives me the feeling of those room dividers or Shoji that you sometimes see in movies. It also makes me think of the Ukiyo-e art style from Japan. Simple, yet lovely. Overall I really like the style and feel of the game. I think that everything looks nice. The only thing that I could recommend would have been some miniatures that matched the Daimyo. I think it would have helped give a more thematic feel to the game. Still, for a small and simple card game, I’m not complaining. The rulebook for this game is a fairly large double sided sheet of paper. The paper quality is actually pretty thick. There are lots of pictures and examples all over the page. Everything is covered and explained quite well. I couldn’t find anything that was difficult to understand at all. It’s pretty simple and quick to read. I couldn’t really find anything that looked bad. Overall I think the designer did a good job designing the rulebook. It’s pretty good. This is a rather interesting game that combines elements of area control, trick taking and card drafting. You start the game by drafting cards which helps mitigate the luck of the draw aspect, since you at least know 2 cards that the player to your left has. Once you’ve gotten that part taken care of the game moves into trick taking. This part reminded me a lot of Diamonsters with the whole “ninja wins if there’s a 6 on the table” part. That made me think of how the 1 beats the 5 in that game. Moving on from there, the area control part kicks in as you gain points for having the majority in a region. Of course there’s more to the game than just those elements, as you’ll want to think about which action you’ll want to take when playing your cards. Will you want to add samurai tokens to an area or will you want to use action points to move your Daimyo or your samurai tokens. There’s actually quite a lot of strategy involved in such a small game. This might cause a bit of Analysis Paralysis making the game go a bit longer than it should. The area control aspect of the game made me think of a game I recently reviewed, Saga of the Northmen. However that game is a bit more streamlined than this one is. For this one you have to figure out how many points you have in each area and then divy out points based on the 3 highest points for each area. It tends to slow things down just a bit. I feel that it could have been a bit smoother and easier to figure out. It’s not a big deal as the game only lasts 3 rounds. I think it would have been a lot more annoying if it went longer. Overall the game is pretty good. I think fans of trick taking or area control games might enjoy this one. It’s a good game that mixes several mechanics into an intriguing stew of coolness. This is a game that I would recommend giving a try. Joraku is a mash up of several mechanics into an intriguing game of strategy. It does tend to play a bit longer than I’d have imagined. Most game sessions last around 45 minutes to an hour. The artwork is great, especially on the skirmish and Daimyo cards. I really like the different character designs. Of course it would have been great to have had some miniatures instead of the wooden Daimyo tokens, but that’s just a secret wish of mine in case the game ever gets a deluxe edition. The game mixes elements of card drafting, trick taking and area control into a pretty strategic game. Players might find themselves a bit prone to Analysis Paralysis as they try to determine which card to play and which actions to take. I feel that the area control aspect of the game was a bit more convoluted that it should have been. I wish it had been a bit more streamlined like Saga of the Northmen. Still, this doesn’t make it a bad game in any way. Fans of trick taking or area control games might enjoy this one. Overall it’s a good game that I like. It’s one that I would recommend giving a try. Now prepare for war. This entry was posted in Reviews and tagged board, board games, card, card games, games, iori, iori tsukinami, joraku, minstrel, tasty, tasty minstrel games, tsukinami. Bookmark the permalink.